Charles William Hall was born in Stokesley in 1896 the son of William Martin Hall, a farmer born in Nunthorpe and his wife Emma, born in Haughton, Durham. Charles, his sister, Eleanor Marian and brother, Frederick Walter were all born in Stokesley, where they lived in Springfield. Charles attested on 16th November 1915 at Middlesbrough and was called to join the Royal Engineers 232 Company on 2nd March 1916. At his attestation he was 19 years old and a draughtsman by occupation. He was described as 5’ 7¼“ tall with a chest measurement of 36”. He had a fresh complexion, brown hair and blue eyes. His Next of Kin were his parents at Springfield, Stokesley. Charles Hall joined the Royal Engineers as Sapper 1356 where he was paid as at skilled draughtsman rates - 1s 4d. (He was later given the new regimental number of 131309). Sapper Hall was sent to France on 9th March 1916, and according to his sister's account was in great danger of capture in the following year when an initial British advance was suddenly repulsed by a fierce German counter-offensive. Charles and his unit extricated themselves with some difficulty. Charles was wounded in June 1918, and seems to have been hospitalised as a consequence. In September 1918, however, with the Germans in full retreat, Charles was en route to join the 92nd Company Royal Engineers when he received further wounds to his arm and left side/thigh. He was sent to the hospital in Rouen and from there to the US Navy Base No 3 Hospital, Seafield Heath. His injuries resulted in him having his left leg amputated. A Court of Inquiry was held and the incident was recorded as an accident. His sister, writing later, tells us that this happened when a pistol was discharged as Charles descended from his train, but she gives no further details. Charles appeared before a Medical Board which assessed his degree of disablement as 60% for which he received a life pension of 24 shillings per week. He was discharged as “no longer fit for military service” on 3rd April 1919. He received the British War Medal, the Victory Medal and the Silver War Badge. Charles returned to Stokesley and devoted his life to his town and his Fallen comrades. He was active in Church life, a tee-totaller and a tireless worker despite his handicap. Charles is remembered for putting the graveyard in order and for planting the beautiful horse chestnut avenue along the Leven, but more especially for the Stokesley Book of Remembrance, the production of which by a team of volunteers he first inspired and then co-ordinated together with his sister Marian. This beautiful tribute to Stokesley's Fallen was placed in the Parish Church in 1926, and remains there to this day. The research done by Charles and his friends towards the making of the book underpins much of the information on this website. After their parents died, Charles and Marian lived on in the house at Springfield. They collaborated in collecting materials for the making of a History of Stokesley, and produced a journal, started by Charles and continued after his death by Marian, whose extensive comments and records help to make the work the best eye-witness account of the life of the town from the beginning of the 20th century to 1973, when Marian died. (She was buried under the name of Marion). Charles met his end at the beginning of World War Two. He was working on the design of engines for the new class of ship called the 'corvette' and as part of his work he sailed with the French ship "La Bastiaise" when it went out on trials in Tees Bay. The unfortunate vessel struck an enemy mine and sank within minutes. Nearly every man on board perished, and Charles was just one of those whose bodies were never recovered. His sister's touching tribute to Charles is recorded elsewhere on the website. Their journal was partly transcribed by Tom Berry and published by the Stokesley Society in Millennium year. Thomas Lawrence Harforth was born in 1897, the son of John Harforth and his wife Annie. John was a farmer from Lythe and his wife Annie (nee Harrison) was from Egton. In 1901 they were living at Scaling with Thomas and his older brother John and younger sister Mabel. By 1911 Annie was a widow of independent means living in Union Terrace, Stokesley with children, Lawrence, Mabel, George and Bertie. Thomas attested on 11th December 1915 at which time his address was College Square, Stokesley. He was 18 years and 6 months old, born in Scaling and was a joiner’s apprentice. He was 5’ 7 ½ “, 117lbs, and had a 33 ½ chest. His physical development was good. He was placed in the Royal Engineers 426 WL Reserve Field Company with the regimental number 9257. (Thomas's number was changed to 180602 and then to 428692). He was mobilised and posted on 13th May 1916 as a Sapper. His next of kin was his mother who moved to Rushford House, Springfield, Stokesley in May 1919. Sapper Harforth remained in England until 1st April 1917 when he was sent to join the BEF at the General Base Depot in France. Thomas was classed as a proficient carpenter and joiner and received the equivalent rate of pay of 1 shilling, which was increased to 1s 4d when he was classed as skilled (31/3/1917) and increased again to “superior” rate in October the same year, with a rate of pay of 1s 8d. Thomas's records indicate that he went on leave to Lourdes in 1919 and was demobbed on 24th September the same year. When discharged he was Lance Corporal 428692 of 457 WR Field Company Royal Engineers. He was awarded the British War Medal and the Victory Medal. From a study of local registration records, it seems likely that he married Kathleen Swales in Middlesbrough District in 1929. He died in 1982 in the Northallerton district. Cedric Joe Harland was born in Stokesley in 1899, the son of Charles Harland, a groom/labourer from Stockton and his wife Frances, (nee Storey). In 1891 and 1901 Cedric was living in Stockton with his parents and siblings but in the census of 1911 he was listed at the Golden Lion Hotel, Stokesley where he worked as a groom. The proprietor was William Henry Wilson, himself born in Hartlepool, who lived there with his wife Emma and 3 children all born in Stokesley. Cedric married Edith Stayman in Stockton early in 1914. It was not many weeks before the outbreak of war, and we can deduce that he volunteered soon afterwards. Although the only surviving war record so far found for Cedric is his medal card, this shows that he “entered” the war in France on 13th September 1915 in the Army Veterinary Corps (AVC), an appropriate placement, perhaps, for a groom. He was then Private SE/10710, but was later promoted to Sergeant. It was as sergeant SE/10710, 51st AVC, that he qualified for the medals that he was awarded - the 1915 Star, British War Medal and Victory Medal. We can find no further details of his service, but according to the Absent Voters List of 1918, he and his wife were at that time living on the High Street. Cedric and Edith had one child, Ernest Stayman Harland, who married Hilda Redfearn in 1938. (Ernest and his wife had 2 children, Ann and Alan, but sadly Ernest was killed in WW2 in Greece - See section on WW2. Hilda was granted probate following her husband’s death. She re-married in 1946 to Philip Henwood and had a further 3 children). Cedric is mentioned in the Hall Diary. He lived until May 1952, dying shortly after being widowed. Probate was granted to a solicitor’s managing clerk and to Harold James Foster, sub postmaster. Thomas was born in Stokesley in 1880 the son of William Harper, a labourer, and Mary. In 1891 he was living in Stokesley with his parents, 1 younger brother and 2 younger sisters but by 1901 he had left the area and was an Assistant teacher in Stanley Street, Ormskirk. However, in 1911 he was again living in Yarm and was a teacher in the Council School in College Square. Thomas Harper attested at Cocken Hall on 18th September 1914 when he gave his age as 31 years and 90 days. His occupation was still Teacher and he gace the name of his father, William Harper of South Side, Stokesley as next of kin. Thomas was 5’ 11” tall, weighing 158lbs and with a chest measurement of . He had a fresh complexion, blue eyes and light brown hair. Originally he joined the General Service County Battalion, as Private 83 of the 18th Battalion DLI (Durham Pals). This regiment was part of Kitchener's New Army raised in September 1914 in Durham and was based at Cocken Hall during the winter of 1914-15. Thomas was transferred to the 31st Division Cyclist Corps with a new number, 10330, on 2nd Oct 1915. However, he remained “home” till 11th December 1915 when he was sent to Egypt. He remained there until 7th March 1916 but was then sent to France, where preparations were being made for the great offensive known as the Battle of the Somme. Thomas was again transferred - to the 11th Battalion East Lancashire Regiment - on 22nd May 1916. Presumably he fought with them in the Somme campaign, and throughout the next year, but on $th March 1918, Thomas was again transferred - this time to the Royal Engineers - where he became number 343559 and was posted to the Stores Division. On demobilisation he was WR/278901 Pioneer in the Royal Engineers. Thomas Harper was awarded the 14-15 Star, British and Victory medals which were sent to him on the 18th Sept 1925 at The Queen’s Head, Stokesley. He died on 21st November 1936 at Cromwell House, Stokesley. His effects were left to William Harper, drainer. James was born in Margate on 14th October 1877, the son of Joseph Headlam a fisherman from Whitby and Jane from Margate. Between 1891 and 1900 James moved to Stokesley where he married his wife Lydia in that year. Lydia was the daughter of Thomas Johnson and Hannah Walker. In the 1901 census James is listed as a bricklayer, living with his wife and their young son Reuben. James had first joined the volunteer force on 3rd March 1897 and it was from this force that he joined the newly formed territorial force in 1908. He enlisted into the Territorial Army (1/4th Battalion Yorkshire Regiment) as Private 176 on 3rd April 1908. At this point he was 31 years old and working as a bricklayer for P H Dobson in Stokesley. He was promoted to Corporal in 1910 and Lance Sergeant in 1913. James was embodied “at home” as Lance Sergeant on 5th August 1914 and promoted to Sergeant on 11th November 1914. He embarked at Folkestone for Boulogne on 16th April 1915. The unit was thrown into immediate action to stall a dangerous German Offensive, and many of his local colleagues died or were wounded in the first few weeks. James himself was attached to the 150th Brigade Machine Gun company in February 1916 and promoted to the rank of A/C A M Sergeant in March 1916. On 31st March 1916 he returned to England as his time had “expired” i.e. the length of time he had joined up for was completed. James attested once more on 7th July 1920 into the TA 4th Yorkshire Regiment. His date of birth was given as 14th October 1877. His address was College Square, Stokesley and his occupation was contractor. He was 43 years and 9 months old. His physical description is as follows: 5’ 6 ½ “ tall, chest 38”, weight 156lbs, eyes brown, hair dark brown, and of dark complexion. He had served previously until “time expired”. His next of kin was his wife, Lydia, nee Johnson. He had 5 children: Reuben born 1901 (died 1905), William Henry born 4th Dec 1904, Phyllis Amelia born 15th Nov 1907, Muriel born 22nd Feb 1910, and James born 18th Sept 1915. On 31st July 1920 he was promoted from Sergeant to CSM. He attended annual training and signed on for a further year’ eventually leaving on 13th July 1922. James died on 26th March 1953 whilst living in College Square, Stokesley. Probate was granted to William Henry Headlam and Harry Shires. It is likely that his son William married Monica Agar in 1924 and they had at least 3 children. His daughter Phyllis married William Rutherford in 1933. Allan Pickering Johnson was born in Stokesley in 1888, the son of William Johnson, a joiner and his wife Dorothy. Census returns from 1891, 1901, and 1911 show Allan living with his parents and siblings in South Side, Hutton, and by 1911 Allan, like his father, was a joiner. Allan married Eliza Leggott in 1914 and they subsequently had at least 3 children in the Stokesley area - and possibly a son, Henry born at Great Ouseburn. Allan Johnson's military service records do not seem to have survived, but he is listed on the Royal Marines Medal Roll as receiving the British War Medal. From the Absent Voters List of 1918, we know that the Johnson's had moved to West Green Stokesley, and that allan had joined the Royal Marine Engineers. This document tells us his service number, 3085/s, from which we can tell that he had signed for a 'short service' placement. From a post on the Great War Forum: RME companies were raised early in 1918 to work on projects and constructions in out of the way places such as Scappa Flow. Allan’s expertise as a joiner would have proved useful here. Men were mainly recruited from the Inland Water Transport section of the Royal Engineers. They received some military training and were paid the same as the RE. Many distinguished engineers and architects served. The headquarters were at Chatham although there were mobile headquarters at Southwick, Brighton and Scappa Flow. In Brighton they built “mystery” towers (no-one knows what they were for). At Scappa Flow they built an aerodrome and laid an oil pip from Clyde to Forth under the guidance of skilled American engineers. Frederick was born in Stokesley on 14th September 1899, the son of George Johnson and his wife Elizabeth. In 1901 he was living in Milburn Yard, Stokesley with his parents and 4 older siblings. In 1911 he was living with his parents (father described as Rural District Council Scavenger), 3 older siblings and 2 young nephews. He enlisted on 14th September 1917 into the 6th Bn West Riding but was not called for service until 16th January 1918 aged 18 years and 4 months, at which time he was transferred to the 3rd Bn West Riding. He was 5’ 6 ¾ “ tall, with a chest measurement of 36”. He was a cartman by trade. His next of kin was given as his parents, Elizabeth of Brewery Yard, Stokesley. He was not sent abroad and was demobbed on 28th January 1919. He was not away from the army for long, and joined the 4th Battalion Yorkshire Regiment (Territorial Force) for a 2 year period in Oct 1920 at which time he was 21 years and 1 month, 5’ 8” tall, weighing 154 lbs and with a chest measurement of 38”. His description at this time tells us that he had dark brown hair, dark brown eyes and a dark complexion. CSM James Headlam signed his papers (see Headlam's record elsewhere in They also Served). Frederick was described as a labourer, and still living in Brewery Lane and still single. He was promoted to Corporal in July 1922 and was discharged 7th October 1922 upon the termination of his period of engagement. Frederick married Amelia Barker in Stokesley in 1932. He apparently died in 1960 at which time he was living at Low Worsall Yarm. Administration was given to his widow. Lancelot Johnson was born in 1889 at Chop Gate, the son of Garbutt Johnson and Jane Sherwood. He enlisted at Stokesley on 11th December 1915 at which time he was 27 years and 3 months old. His documents tell us that he was a farmer and that he was 5’ 2” tall, with a 32” chest and weighed 101 lbs. He had a scar on his forehead. His next of kin was given as his sister, Annie Eliza Johnson of Chop Gate. Lancelot was posted to the 3rd Yorkshire Regiment in March 1916 but was transferred to 9th Yorkshire Regiment on 9th July 1916 and went to France where he was immediately placed in the 37th IDB (Infantry Base Depot). Each soldier on arrival in France was placed in an IBD, such depots were holding camps where men were kept in training until they were sent to the Front. Each infantry division had its own IBD, and pre August 1916 each regiment had its own camp within the IBD. Having been moved to the Front, Lancelot and was wounded in action – a gun shot wound to left leg – on 21st September 1916. He was transferred to the 94th Labour Company in 1917. He was of “good” character. Lancelot was hospitalised with influenza in 1918 but survived and was demobbed on 21st March 1919 to Rievaulx House, Chop Gate. He received the Victory Medal and British War Medal. Lancelot Johnson married Minnie Mattison in 1929 in Stokesley, and lived until 1969. Ronald was born in Stokesley in 1898 the son of Thomas Johnson and his wife Hannah. In 1901 he was living with his parents and 5 older siblings and one younger in Back Lane, Stokesley. His father was a brewer’s manager. In 1911 Ronald was still with his parents, but now with one older sibling and 2 younger. His father was then a brewer. Ronald attested and joined from the army reserve in Stokesley on 20th February 1916 when he was 18 years and 1 month old. He was 5’ 2 ¼ “ tall with a chest of 36”. His next of kin was given as his mother Hannah of North Road, Stokesley and his occupation was farm servant. His medical history for 1918 prior to being sent abroad shows Ronald as 20 years old, of good physical development, 5’ 2 ¼" tall and weighing 120lbs. His chest measurement was 36” and he had dark brown hair, hazel eyes and a fresh complexion. Ronald arrived at Boulogne on 30th September 1918 and was placed in the Base Depot at Etaples on 1st October from where he was posted to 9 Battalion Yorkshire Regiment. At this time his next of kin was recorded as his sister, Rhoda. He was wounded receiving a gunshot wound to the thigh on 10th October 1918 and was sent to hospital and rejoined his battalion on 11th November 1918, the very day the war ended! Ronald Johnson returned to England in February 1919. His disability statement and ID card for February 1919 gives his address as Primrose Hill, Little Broughton. It is probable that he died in 1967. Edward Kelly was born in Great Busby, Stokesley district in the December quarter of 1890. In 1891 he was only 5 months old and living at Old Farm Stokesley with his parents John (a farm labourer) and Ann Kelly. John and Ann were Catholics and had married in Ireland. In the household were also six older brothers and sisters. The parents and the eldest three children were all born in Ireland, but the others were born locally. In 1901, the family was living at West End in Stokesley. Edward was 10 years old and his father was then a stone breaker in the quarry. Edward joined the army on 17th June 1909 at Beverley, having attested at Middlesbrough at the age of 18 years and 8 months. At this time, his parents were living in Stockton on Tees. Edward's occupation at the time was 'unskilled labourer'. He was 5'7" tall and weighed 121 lbs. His chest measurement was given as 36" and he had a fresh complexion, blue eyes and auburn hair. Edward joined the East Yorkshire Regiment as Pte 9342 and served in India from 1911 to December 1914. Edward was posted to France on 15th January 1915 till 16th February 1915 and again from January 1916 to July 1916. During this time, Edward was appointed acting unpaid Lance Corporal (March 1916) whilst with the 1st East Yorkshire regiment. In July 1916 he was wounded in the legs and arms by shrapnel and sent back to Britain. On 19th December, 1916, he was posted to the 7th East Yorkshires and transferred once more, on 24th February 1917, to the 3rd Battalion. 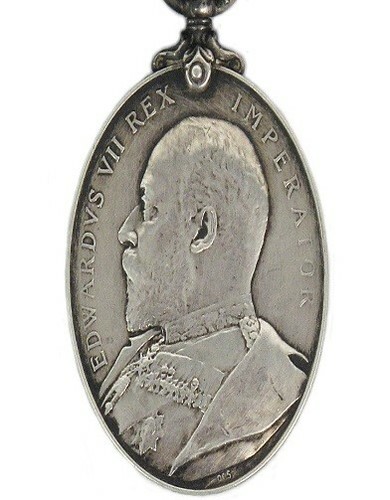 Edward's medal listings show him as Corporal 4334190. He was awarded the British War Medal, the Victory Medal and the 1915 Star. He also received the General Service Medal with the Iraq Clasp. Edward was discharged on 12th April 1919. Harry was born in 1899 in Kirkby the son of George Mello Kitching, farmer, and his wife Mary. In 1901 he was living with his parents in Kirkby Lane and in 1911 living at Greencroft, Kirkby with his parents and younger sister. Harry attested on 5th April 1917 when he was 17 years and 11 months old. He was living at that time at Kirkby Lane Farm and described himself as a farm horseman. He was placed in the reserve and posted to 3 Battalion Yorkshire Regiment in West Hartlepool on 19th May 1918 and on 14th September he embarked for France with 2 Yorkshire Regiment. Harry was permanently compulsorily transferred to the West Riding (Duke of Wellington’s) Regiment as Private 35842 on 16th September 1918. A description is given of him apparently aged 18 years and 11 months when he was described as 5’ 4¾“ with a chest measurement of 33”. His next of kin according to this document was his mother. Harry was gassed in October 1918 and was hospitalised as a result. By the time he re-joined his unit on 16th November 1918, hostilities had ceased. He received the British War Medal and Victory Medal. Harry appears to have died in the Northallerton district in 1980. John Wilfred Kitching was born in Whorlton in 1878, the son of John Kitching, a farmer, and his wife Mary. In 1881 John Wilfred appears in the census record as living with his parents, 8 siblings, a governess and servants at Whorl Hill. His mother died in 1884 but the family continued to live at Whorl Hill, although in the census returns for 1891 and 1901, jon Wilfred was known simply as Wilfred. In 1911 Wilfred was living in Manchester House, Stokesley with his wife Ann Mary (nee Gent), daughter Marjorie, a shop apprentice, Joseph Robert Mudd and a general servant. John Wilfred Kitching at this time was a draper and employer. Wilfred Kitching attested on 10th December 1915 aged 37 years and 11 months, and was placed in the army reserve. He was mobilised on 2nd May 1917 when he was posted to the 36th Northumberland Fusiliers as Private 341438. On mobilisation his records describe him as a Master Draper, Occupational group 37, and a Wesleyan by faith. Wilfred was transferred to the 100th Reserve Protection Company early in September 1917 but moved almost immediately to the 51st Company. In December that year he moved to the 52nd Company, Royal Defence Corps Infantry. This is the number by which he is identified in th 1918 absent Voter's list, which also gives his address as High Street Stokesley. Wilfred Kitching was discharged in London on 6th September 1918, when he was described as 40 years and 8 months old. He was 5’ 7 ½ “ and had fair hair, hazel eyes and a fresh complexion, and residing at High Street, Stokesley. He was discharged as “no longer physically fit for war service” and his character was described as “satisfactory, steady, well conducted”. As he had not served abroad, he was not eligible for the medals which most servicemen were awarded as of right..
Wilfred was suffering from gastritis but although he said that he had always had such problems, the army doctor thought it had been aggravated due to him having to live on rations which caused him to be sick and lose weight. Although his teeth seemed sufficiently good enough for mastication, a note was also made stating “if teeth require attention, this should be done as it may be expected to remove the aggravation. 23/10/1918”. He was also given a £5 gratuity and was awarded an increase of 20% in pension for his children. (He and his wife had 3 children, Beatrice, Nellie and Edith). He received the Silver War Badge in March 1919. 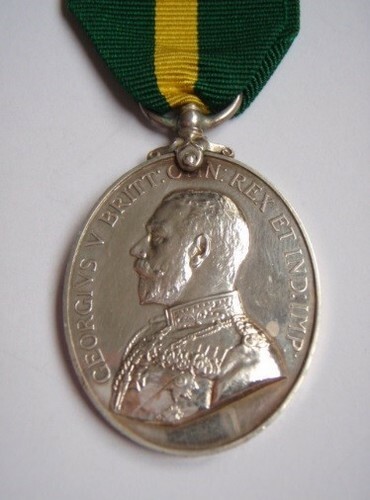 This was awarded to all men who had served in the war and had been discharged due to injurty or illness caused by war service. John’s children all married: Beatrice married William T Alderson in 1934 and had a daughter Gwendoline; Nellie married Maurice A Hugill in 1936 and Edith married Francis J Grainge in 1935. John died on 22nd January 1966 at which time his address was 28 College Square, Stokesley. Probate was granted to Beatrice Alderson, widow, Arthur Hugill, farmer and David Culmer Edge, insurance agent. Harry Knaggs was born in 1893 in Bilsdale the son of Levi Knaggs, a mason’s labourer, and his wife Jane. In the 1901 census, Harry was listed as living at Halterley, Bilsdale with his parents and younger brother Alonzo. By 1911 Harry’s mother had died and so he was living with his father and brother in Bilsdale, at which time Harry was employed as a letter carrier. Harry Knaggs enlisted into the Yorkshire Regiment on 10th December 1915 aged 23 years and 8 months. He was 5’ 7” with a 33” chest, and weighed 129 lbs. He was described as of fair physical development although his little finger on his left hand was contracted. He was a carter by trade and his next of kin was his father Levi of Chop Gate. Harry was posted to France with the 10th Yorkshire Regiment on 1st June 1916 and was soon admitted to the filed ambulance station with a sprained ankle (7th June). In 1917, shortly after having 10 days leave' he received a shrapnel wound to his left shoulder on 20th October 1917. He was hospitalised for nearly 6 weeks but returned to his unit on 1st December 1917. Harry was transferred to 2nd West Yorkshire Regiment on 6th April 1918 when the great offensive known as the Kaiserschlact was launched by the Germans and was gassed on 24th August (“Yellow” gas i.e. mustard gas). After time away to recover, Harry returned to the front on 6th October 1918 but died from flu on 14th November 1918. The war had effectively ended three days earlier! Harry’s possessions were returned to his father and included his name disc, cigarette case and badge. 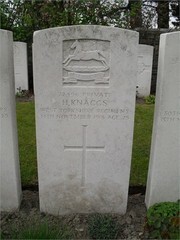 Private Knaggs received the British and Victory medals and is buried in Douai British Cemetery, Cuincy. Harry is also remembered on the memorial at Chop Gate.